The Absolute shipyard placed itself on the world nautical scenery in 2002. Relatively recent, they emerged out of their shell and became a reference point for exquisite craftsmanship, phenomenal originality, and admirable luxuriousness designing environmentally friendly vessels while at the same time respecting the Ocean by reducing the emissions as much as possible. The Absolute shipyard is making an effort to differentiate themselves from their competition by meeting the tastes of customers’ demands and broadening their horizon with each and every yacht they make. In the wake of their missionary endeavors, the Absolute Navetta 58 surfaced as a new protagonist of their maritime story. This protagonist is a long range craft that has become a trendsetter in nautical terms. Her best virtues are her comfort, strong character, and synthesis of both modern and classic touches and practicality. The Absolute Navetta 58 sale goes rapidly and you can be the owner of this seductress too. The overall length of the Navetta 58 is 55 feet and 9 inches while her beam is 16 feet and 5 inches. One can choose among four entrances to this beauty, two directly from the side passages and two on the stern platform. The sense of security is confirmed by both the side long bulwarks and the protection gunwale simultaneously going with the entire edge of the main deck and flybridge. Handrails are installed along all passages fortifying the feeling of security. 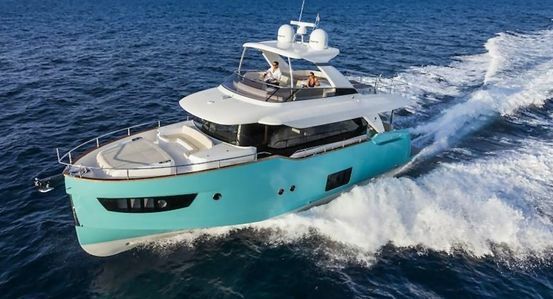 However, nothing can be measured while being on board during the ride, where security is personally felt when the Navetta 58 crashes the waves safely and confidently with the absence of sinister crunches. Thanks to the high chine ahead, the spray is prevented when the bow punches through the big seas. Regarding her outside appearance, a nice touch is certainly the unusual teal green hull which gives it a unique style while portholes and immense windows disrupt the mass monotony. As a result of a strong collaboration between Absolute and IPS, the aforementioned shipyard earned a first-class reputation. The buyer has two options with regards to the engine. This beauty comes in two engine sizes (IPS 600 and IPS 800) and a ranging horsepower between 435 horsepower or 620 horsepower. Whichever engine is chosen, both of them possess famous fuel economy. Needless to say, when it comes to speed, these engines do differ. If chosen 2 x D6-IPS 600, the yacht achieves cruising speeds of up to 14 knots and fuel consumption (during the cruising speed) of approximately 1.87 gallons per mile. On the other hand, if the other engine is chosen, it gets faster to 18 knots during the cruising speed and top speed of around 29 knots. Cruising speed of 18 knots, understandably, consumes more fuel of around 42 gallons per hour. Nevertheless, Navetta 58 contains a fuel capacity of 635 gallons, allowing the boat to stay at sea for extremely long journeys, having no demand for refilling. Thanks to the IPS technology, Navetta 58 performs with less consumption ending in less pollution and more generosity to the ocean and nature. Options for making the ride more comfortable like Volvo Penta Trim Assist or gyroscope are available too. The interiors of the boat, both the below deck and the main saloon, peacock by the immense volume and space. The breath of the flank windows on the main deck gives plenty of light discovering fantastic details and features of the saloon and the galley. The port side of the cockpit is occupied by a U-shaped sofa and a rectangular table. The galley is placed amidship thus occupying the starboard side of the cockpit. The galley is raised a couple of steps up from the main lounging area aft. It is elegantly furnished with a cooktop, lovely upper storage, beautiful sink, microwave and a fridge. While preparing meals, one can look through the windows and admire the panorama or even talk to the people sitting in the main saloon. The main salon possesses a huge white U-shaped sofa with a table. Opposite is a smaller one with a flat screen TV. Both of the sides are bathed with light via enormous windows above the sofas making the main saloon a great place for entertainment and family gatherings. Absolute made a great effort in turning this seducer into a home thus all the cabins and settings contain the highest roofs in the category and additionally made floors without steps. This extraordinary design leaves more interior than one could ever imagine. The flybridge discovers the same contours as the rest of the ship. It’s spacious, elegant and functional. The helm station has only one seat; however there are immediate seats behind it port and starboard for keeping the skipper company during the ride. Amidship of the flybridge is quite practical since it has a wetbar containing a sink, fridge, ice-maker and a griddle. A large settee around a table highlights the socialization on the flybridge while the aft part of the flybridge is opened for sunbathing. The below deck comprises of three double cabins with private bathrooms and a full-beam master suite. Guests are overjoyed during their stay below deck, especially with a VIP cabin. A gorgeous en-suite with a separate shower cubicle really blazes the cabin with its elegance. Double berth cabin is cozy as well. The portholes give light to the cabin and a mirror is placed above the berths. Full-beam master cabin is commodious and wood details give a nice coloring to it. The floor is flattened except a small step leading to the lovely sofa to starboard and a small step to the dressing table to port. Three large windows both port and starboard, occupy the walls of the room plus portholes contributing to the cabin’s grandeur. The bathroom has nice touches as well like the marble countertop and a separate shower cubicle. One can comprehend the successful Navetta 58 sale while reading through her attributes. The Navetta 58 is Absolute’s masterpiece stunning all sea lovers around the world. The Navetta 58 review discovers a lot of her pros and advantages uncovering her strength and artistry. You will fall in love with this dreamboat if you contact us now and ask for any details whatsoever. Don’t wait and hesitate, take control of your life with Navetta 58 and discover the Ocean with your family and friends. Flat screen TV. Both of the sides are bathed with light via enormous windows above the sofas making the main saloon a great place for entertainment and family gatherings. It is elegantly furnished with a cooktop, lovely upper storage, beautiful sink, microwave and a fridge. One can choose among four entrances to this beauty, two directly from the side passages and two on the stern platform. The sense of security is confirmed by both the side long bulwarks and the protection gunwale simultaneously going with the entire edge of the main deck and flybridge. Thanks to the high chine ahead, the spray is prevented when the bow punches through the big seas. Regarding her outside appearance, a nice touch is certainly the unusual teal green hull which gives it a unique style while portholes and immense windows disrupt the mass monotony. The interiors of the boat, both the below deck and the main saloon, peacock by the immense volume and space. The breath of the flank windows on the main deck gives plenty of light discovering fantastic details and features of the saloon and the galley. The port side of the cockpit is occupied by a U-shaped sofa and a rectangular table. The galley is placed amidship thus occupying the starboard side of the cockpit. The galley is raised a couple of steps up from the main lounging area aft.